Martin D. Herman, M.D., Ph.D. is a board certified neurosurgeon who completed his undergraduate degree at M.I.T. and graduated from the University of Illinois with an M.D. and M.S. in Molecular Biology, where he was a James Scholar. He completed his neurosurgery residency in neurological surgery and PhD at Northwestern University in 1995. He continued his training in spine fusion surgery on the Department of Orthopaedics at the Rush Medical Center. Dr. Herman has been an attending neurosurgeon at the Lutheran General Hospital since 1995, and has been Division Director in Neurosurgery since 2003. Dr. Herman is an Assistant Professor at Rush University Medical Center and is the Rush University Local Site Neurosurgery Residency Director since 2006. He has been invited to speak about Minimally Invasive Spinal Surgery at numerous major academic programs in the United States and Internationally. He has lectured at the American Association of Neurosurgery Meetings; at the University of Chicago; Northwestern University; Mayo/Mayfield Clinic Meeting; in Panama, Peru and Argentina. 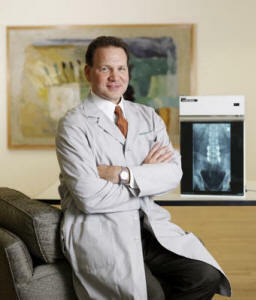 He was featured on the first live spinal surgery webcast in 2002. He has been named a Top US Doctor and Top Chicago Doctor for more than a decade and has been featured in Chicago Magazine.